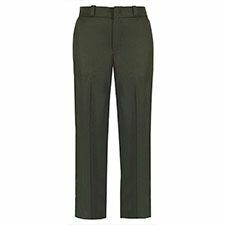 Elbeco womens Spruce Green 100% Polyester Pants with 1" Black Stripe. Elbeco's most popular texturized Gabardine trouser, now enhanced with NANO-DRY technology - for PERMANENT moisture control to move perspiration away from your body! Fabric: The upgraded 100% Dacron® polyester from Burlington Raeford features a texturized, woven gabardine engineered with mechanical stretch for superior ease of motion and comfort. New NANO-DRY technology gives PERMANENT moisture control, breathability and soil resistance.